Donald Trump rooted for the housing market to collapse because he believed there was money to be made. For Andrew Crider of Nevada, the shockwaves from that crash were deeply personal -- his welding company went out of business in the recession that followed, his family fell behind on bills and their home was foreclosed on. Crider was a Trump supporter. That is, until he heard how "excited" Trump was for the real estate bubble to pop. Now, Crider says he's likely to stay home in November. "We lost our house. 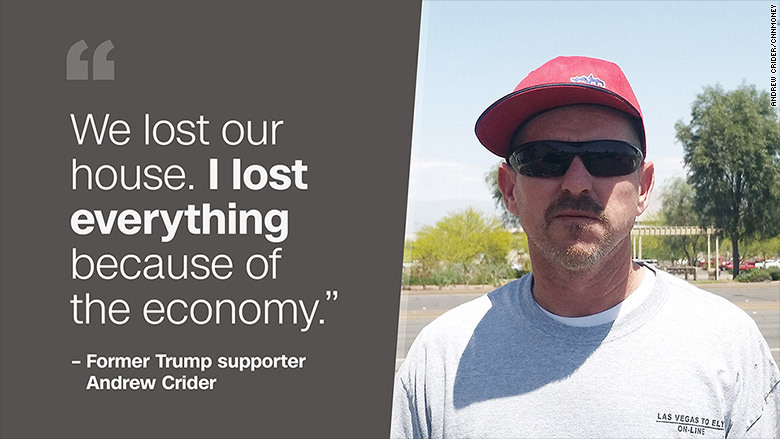 I lost everything because of the economy," Crider of Henderson, NV, told CNNMoney. "Everything crashed at the same time." Crider said he is "offended" by the recently-surfaced comments from Trump showing the billionaire cheered on the housing crash. "It'd be nice if we could put Trump in our shoes, living paycheck to paycheck. Let him see how it really is in the world and that might change his views," said Crider, who along with his wife Hollie has three children. Crider's comments show how Trump's pre-recession remarks could come back to haunt him today. Asked in 2006 about predictions that the real estate market might collapse, Trump said: "I sort of hope that happens because then people like me would go in and buy." A year later, Trump told the Globe and Mail he was "excited" about the possible bursting of the housing bubble. "I've always made more money in bad markets than in good markets," Trump said. Crider, 41, said Trump's comments highlight the problem with the world: "The rich get richer and there is no middle class. If you have money, you're going to keep money," he said. Crider had previously told CNNMoney he would vote for Trump because he was the "less of the evils" among the politicians running for the White House this cycle. Now, the Nevada resident said he doesn't support either Trump or Hillary Clinton and may not vote at all. "Either way we're screwed," Crider said, echoing the distaste that many voters have for the likely nominees from each major party. In recent days Clinton has slammed Trump in a new campaign ad and on Twitter for trying to "cash in" when "millions of families saw their life savings destroyed in the Great Recession." Millions of families saw their life savings destroyed in the Great Recession. Trump responded on Tuesday by saying he was merely trying to do what everyone strives for: buy low and sell high. "I'm a businessman, that's what I'm supposed to do," Trump said. "If it goes down, it goes down. I feel badly for everybody. What am I going to do? It's business!" Trump too wasn't left unscathed by the housing crash. The billionaire launched a mortgage broker in the spring 2006 near the top of the market. Trump Mortgage closed down less than two years later as the real estate market imploded. The Nevada region where Crider lives was at the epicenter of the housing downturn. 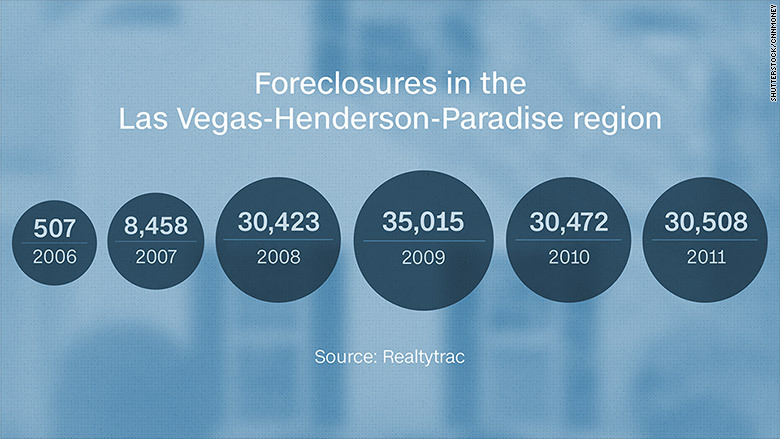 Incredibly, there were roughly 135,000 foreclosures in the Las Vegas-Henderson-Paradise metro area between 2007 and 2011, according to Realtytrac stats provided to CNNMoney. These days the real estate market in Nevada is on the rebound. For instance, the median home value in Henderson is $256,800, up from $153,000 in 2012, according to Zillow. Crider has since resurrected his welding business. "We saved and saved and saved. Now we're rebuilding it," Crider said. But Crider is currently renting. He fears the housing comeback may have been too strong and sees "another fall" coming.